America, has anyone realized that every disaster or problem that occurs in another country, becomes the problem of the United States! Why is this? Why does America always have to come to the rescue? Why doesn’t other countries such as China, Germany, Europe, Japan, Canada, Britain, Africa, Australia, or any other country step up to the plate? Why does America always have to be the country that has to help other countries. 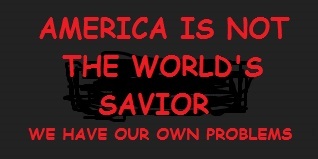 America is not the world’s savior! Yes, American’s are kind hearted people, please realize we have our own problems to deal with! Many need to realize the United State’s can’t save the world, America has it’s own problems that need immediately addressed! America can not take care of the whole world! The Citizens of America should come first! The United State’s Government can’t always help other countries, when they have their own crisis occurring! America do you see any other countries stepping up to the plate “No,” they are taking care of their own country and country people! America, has got it backwards, they are not taking care of their own country people who are suffering drastically! The top 1%’s are not seeing what’s going on within their own country, which is very sad and disturbing! This must be addressed, America can not take care of the entire world, it’s not up to America to solve every countries problems, or take care of other countries or their people! It is not America’s fault, these countries have to learn to take care of themselves and stop pawning off their problems and people on America! These actions are ruining the United State’s! If America goes down who are they going to blame, or run to then? Again, America do you see any other country stepping in to help? What’s wrong with China, Australia, Japan, Britain, Germany, Russia, Africa, and many other developing countries who are currently doing better than the United State’s? What’s wrong with this picture? The world has become dependent upon America for every little thing that occurs in the world! God, forbid if America doesn’t help, if not America is criticized! Well why not criticize the other countries for not helping! Why is America always looked upon to come to the rescue when turmoil erupts? This is the main reason why American Citizens are suffering dramatically and America has become ‘Broke and Broken!’ America is not the “Savior of the world,” once the United State’s Federal Government, realizes this and starts taking care of it’s own “Homeland” maybe America, can advance. America, doesn’t even have money to re-build it’s own infrastructure, so how in the world can they take care of illegal immigrants or fight a war, are you serious people wake up! Let’s view some examples of crises America is facing; Veteran Mistreatment and Death’s, America’s young Adult’s Mistreatment and Death’s, American Citizens still have no healthcare, American Citizens are homeless and Poverty, Elderly American Citizens have become displaced, Millions of American citizens are unemployed, America has no services available for it’s own citizens, Local Government’s lack the much needed funding to help their citizens, There’s a serious Heroin epidemic in the United State’s, Healthcare costs are out of control and unaffordable and many American citizens are still uninsured, Businesses and American Citizens privacy have been violated by international conspirators, Internet security Data Breaches, There’s a housing crisis for American Citizens, Botched Executions, Prison brutality, Attacks against American Women Reproductive Health, International Pharmaceutical Toxic Products and Procedures, U.S. Healthcare Bribery via doctors, scientist and Federal Organizations, International American Corporation and Business Tax – Evader conspiracies, American Banks privately assisting corporations and top 1%’s to hide their income offshore, Wall Street corruption,and Income inequality, along with Tainted Water and Produce! If this doesn’t open your eye’s then what will, this is all currently occurring in America! It doesn’t take a ‘Rocket Scientist’ to realize America has it’s own issue’s to be dealt with, America can not save the world, when indeed they have a laundry list of problems of their own! What are the American families supposed to do, just roll over and die, in the process? Are American’s to fend for themselves with all this turmoil occurring in America? The United State’s isn’t taking care of it’s own citizens and truly can’t afford to take care of the entire world! Other countries need to start doing their part in the world! America has it’s own issue’s to deal with for the American people! Please realize yes, it’s very sad to see other countries fighting and turning against one another and killing thousands of their own citizens, although this is not America’s concern or fault! The world needs to stop holding America accountable! American citizens and the United State’s must come first, we have our own problems! The world needs to cut ‘America’ some slack and allow the United State’s to take care of the American people! America, it’s sad to say, it seems we have to save ourselves, due to the fact the United State’s Government doesn’t care about America or the American people. So every American must band together and start rallying together to save our families, cities, land, and economical resources! If not your families will continue to die off and suffer in America! Please take a look at CABIRI’s ‘Luv Thy Neighbor” Program, this could be a start to helping ourselves. It’s very important for many to ‘Wake up’ these problems aren’t going to just disappear!